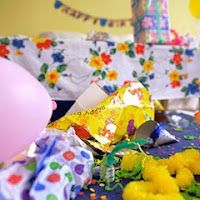 After my 5-year-old son and I decorated for my wife’s birthday, creating a set-up that required tools, heavy machinery and small explosives to take it all down, I found that I hated mess even more, so much so that I never want to decorate again. At Christmastime, I draw, cut out and paint wooden holiday figures for my lawn, a display that usually takes months to prepare. For Halloween, I bring to life my very own haunted cemetery in the front yard, utilizing 5.1-channel surround sound, an action specialist and a team of stuntmen. I love it. But after decorating, I feel an anxiousness in my gut that doesn’t let me . . . gasp . . . breathe until the holiday is over, when I can take the stuff down and return my home to normal. “You never want me to do what I wanna do,” I respond. Yup, I used to go all out when it came to decorating for holidays and special events. That all changed following the episode that took place last month. My son asked if he and I could decorate the house for Mommy’s birthday. I said we could, not knowing my boy would actually outdo me in the decorating department and cause me even greater stress than usual. We put up the typical decorations -- party lights, banners, the birthday throne. And then my son provided some of his own additions. He built a massive birthday cake using Tinker Toys and Lincoln Logs (not edible). He used loads of bendable Wikki Stix to make sticky, messy wall decorations, streamers and party favors. He managed to go through several reams of printer paper, rolls of Scotch tape and buckets of glue to make a birthday crown, birthday signs and cards, birthday games, wrapping paper and, worst of all, confetti. And then he got to the real decorating using building materials and paint. I found I had no control of my son, my life flashing before my eyes. When we were finished decorating, I became so anxious to take it all down that I couldn’t catch my . . . gasp . . . breath. My son asked if I was having a good time. I barely made it to the end of my wife’s birthday. When it came time to clean up, I felt I couldn’t put anything away. The stress finally drove me insane. I piled everything up in the backyard with all of my other holiday decorations, and soaked the pile with lighter fluid. Then I grabbed a box of matches. “What are you doing, Dad?” my son asked. “I found a new way to illuminate the backyard,” I said. He broke into tears when he figured out what was going to happen. He’d come to love decorating. It was great fun, he said. I felt bad for the boy. After all, I’d made him a decorating monster. I tried to comfort him. “Don’t cry, son, we’ll find something else fun to do,” I said as I lit a match. The flame of the matchstick burned toward my two fingers, and I forgot about that while my son convinced me not to burn the decorations. When the fire on the match reached my fingertips, I instinctively threw it. The pile of decorations went up like a chase car on impact in a Michael Bay movie. My son ran to his room to catch his breath. I needed to follow him and cheer him up. I decided instead to stay back and put out the fire before it spread to my house and the surrounding neighborhood. As I cleaned up the cinders that were once the decorations I’d spent so much money on throughout the years, I realized I’d never have to worry about the mess that goes along with a decorating effort ever again. I was very happy. I celebrated my huge victory. My son decorated . . . gasp . . . for the occasion.